Mark Twain once observed, "If you don't read the newspaper, you are uninformed. If you do, you are misinformed." On the whole, I emphatically agree with that statement. I would beg to differ with Mr. Twain on one point, though. In today's Mainstream Media (MSM) environment, I believe you can read the newspaper (or watch the news programs) and still be UNinformed on certain subjects. Of course, those subjects would include things like anything impugning Islam or civil rights organizations or the Administration or the homosexual rights movement or... well, you get the picture. My point is that you will most probably be MISinformed, but on certain topics you'll be UNinformed because the media will NOT report them. For instance, you've probably not heard that Sheikh Abdul Aziz bin Abdullah, the Grand Mufti of Saudi Arabia, recently announced that, "It is necessary to destroy all the churches in the region." By "region," he meant the entire Arabian peninsula, including Saudi Arabia, Yemen, Kuwait, Qatar, United Arab Emirates, Oman, Dubai, and Bahrain. Why is this important? As Grand Mufti of Saudi Arabia, Sheikh Abdul Aziz bin Abdullah is the highest religious authority in the birthplace (Saudi Arabia) and holiest place (Mecca) in all of Islam. 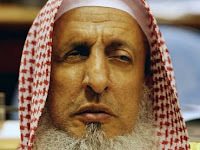 Moreover, he actually heads the highest council of Islamic scholars and chairs the committee that issues fatwas. So when he speaks, it resonates through all of Islam. For him to call for the destruction of all churches in the Arabian peninsula is comparable to the Archbishop of Canterbury calling for the destruction of all mosques in Great Britain, or the Pope calling for the burning of mosques across the world, or the Chief Rabbis of Israel condemning them in Israel. It's a big deal. But not to the Mainstream Media. For them, it merits a yawn. Or worse, a cover-up because it's not politically correct to publish negative reports on Islam, the religion of peace, love, and tolerance. On the other hand, maybe the MSM is simply afraid of Muslims. Look what happened when the pastor of a 50-member congregation in Florida burned a Koran. Heads of State denounced him and Muslims worldwide rioted and murdered innocent people. So maybe the media feels it's safer not to report the Grand Mufti's fatwa. They would rather offend Christians and Jews who won't riot and murder in protest. And you probably won't hear too much about what appears to be the latest grandstanding ploy by the National Association for the Advancement of Colored People (NAACP). In an effort to derail Voter ID laws before the 2012 general election, the NAACP has appealed to the United Nations Human Rights Council (UNHRC) in Geneva, Switzerland. Now, I'm not sure what the NAACP hopes to accomplish with this move, other than keeping the donor funds flowing because it gives the appearance that the organization is actually doing something, even though it's irrelevant and unnecessary. Seeing as how the UNHRC is composed of some of the worst human rights abusers in the world—some of them torture and imprison dissidents, some of them don't allow women to vote, others don't have elections, some don't even claim to be democracies, and several of the European nations have even stricter Voter ID laws than the ones the NAACP is protesting—it seems like an exercise in futility. Or sheer hypocrisy. And besides, the UNHRC has no legal authority to intervene. So what's the point? But I'll bet you won't hear much about it in the MSM. Probably because 32 states have passed Voter ID laws, a monumental majority of Americans are in favor of them (even a large majority of Democrats! ), and the MSM knows that if it blows the whistle on the NAACP, it will only make the Progressive Left look more ridiculous than it does already. Speaking of ridiculous, have you heard about the latest pronouncement by the Department of Health and Human Services (HHS)? Remember the firestorm created when the HHS announced that religious organizations such as hospitals, charities, schools, and colleges and universities will be required to offer their employees insurance packages that include contraceptives and abortifacients? Never mind that the churches which sponsor those organizations are spiritually and morally opposed to those practices. This is Obamacare and it supersedes trivial stuff like spiritual values, morals, conscience, or religious liberty. Well, that attitude turned out to be not a good thing for an Administration standing for re-election in nine months. So you'd think now would be the time to offer a compromise, right? Wrong. Instead, the Administration decided to double down. Last week, the HHS announced that religious colleges and universities (along with all the others) will be required to offer contraceptives, abortifacients, and sterilization in their student insurance packages. Never mind that they are spiritually and morally opposed to those practices. Sounds familiar, doesn't it? Of course, the government is going to order the insurance companies to provide the services "free of charge" to all those students (wink, wink) so the churches which own the schools, colleges, and universities won't feel morally and spiritually violated. Apparently, the Administration still doesn't get it. And besides, why are we offering free sterilization to college students whose lives still lay before them? I would be tempted to say this is just another stupid, tone-deaf maneuver by the Administration if it weren't for something HHS Secretary Kathleen Sebelius told a Congressional committee. She argued that forcing insurers to cover the contraceptive, sterilization, and morning-after pills free of charge to the religious institutions (as if that would salve their wounded consciences) will actually save money in the long-run because it will decrease the number of babies born. She said, "The reduction in the number of pregnancies compensates for the cost of contraception." Europeans are aborting and contracepting themselves out of existence. Meanwhile, Russia is desperately encouraging its citizens to have more children. And we Americans, the world's most Christian nation, are forcing our church colleges to offer free sterilizations to their students. The sad truth is that the Progressive Left has long been a pioneer and promoter of population manipulation and control. Is that what this is about? Or is it simply a conscious attack on our religious heritage and freedom of conscience? Finally, since "March Madness" is in full swing, I'll close this week's program with a report I call, "Rebound!" Though I enjoy basketball, don't expect to get any inside info to help with your tournament brackets! I will discuss a very important part of the Christian's life. That is, how to maintain fellowship with God. It may be more important than you realize. And it may be easier than you think. But it's something that each believer definitely needs to practice.